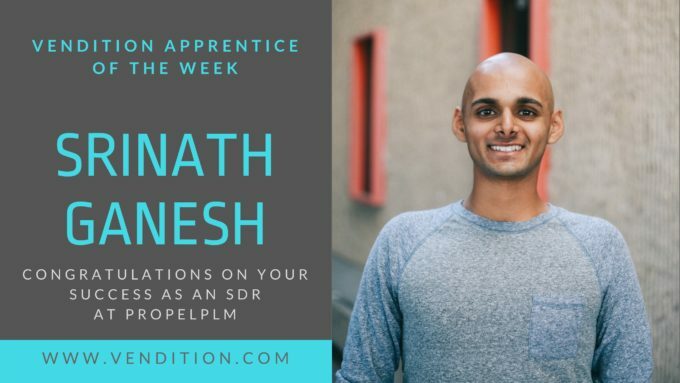 This week, we’re highlighting Srinath Ganesh at PropelPLM as Vendition’s Apprentice of the Week. We’ve been in touch with Srinath since he was a senior at UCSB, and it’s great to see him really hitting his stride as an SDR at Propel. Srinath shares that through trial and error with internships and club participation in college, he figured out sales was the best route for him coming out of school. “My college path was pretty crazy, I originally wanted to be in accounting, and with my internships I kept finding a better fit after each one. After applying to a lot of different jobs and networking events, I realized that I had been doing pretty well in sales-related roles and responsibilities in the clubs I was in. Talking to the Vendition team really helped–they helped me to focus into what a sales development role could really mean, and it felt right. In regards to his coaching sessions during the apprenticeship, Srinath recognizes that he wants to know as much as possible from the start, but Ashleigh made him slow down to allow the process to fully run its course. “Ashleigh does a good job of breaking down the process, not only sales development but also just starting a new role. I’m the kind of person who wants to learn everything as soon as possible, and she made it clear that in the first month it’s going to take time. Her psychological approach helped break my need to know everything immediately starting off. We’re so glad to have met you back at UCSB, Srinath! Keep up the great work, we have no doubt you’ll continue to see success over at PropelPLM. © 2019 Vendition. All Rights Reserved.